Marriott often has promotions for their gift card purchases; sometimes you get a discount, sometimes they load more to the card than you paid, and occasionally they have promotions with the airlines for miles. Now, Marriott has teamed up with Southwest Airlines. You can receive up to 12000 Rapid Rewards points for buying $1000 worth of Marriott gift cards. This promotion is valid from August 1st to November 30th, 2012. You can access this offer here. If you buy the maximum amount of Marriott Gift cards, the value of the Rapid Rewards points you receive is $200 when used for Wanna Get Away fares, $120 when used for Anytime fares, and $100 when used for Business select fares. If you are looking for some Rapid Rewards points and stay Marriott properties frequently, it is no brainer to buy the maximum amount through this offer. You can use the prepaid card to pay for all folio charges at the checkout. Marriott GiftCard Offer Terms and Conditions: This is an online promotion only and cannot be combined with any other offer. Offer not valid on Marriott GiftCards purchased on property, via third parties, or 1.800.813.GIFT. Promotion is valid August 1, 2012 through November 30, 2012 only. The Marriott GiftCard can be used for all purchases and services charged to a Marriott guest room. If you are not a registered hotel guest and are planning to use this card at a spa, restaurant, retail store, or other outlet, please confirm in advance that the Marriott GiftCard is accepted. The Marriott GiftCard cannot be used to secure or confirm a room reservation but may be used as payment at checkout. 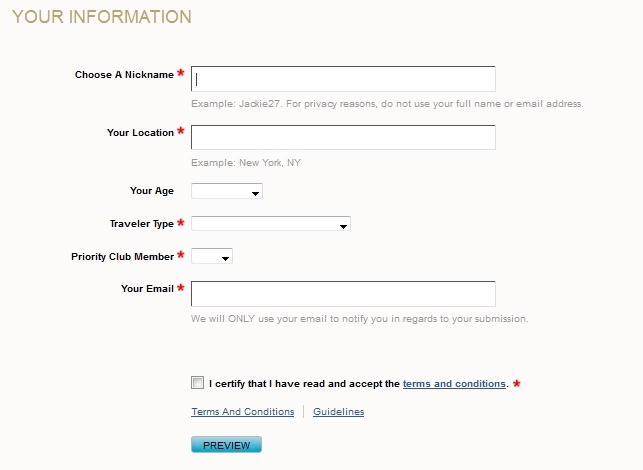 Marriott GiftCard purchases earning Rapid Rewards Points are not eligible for return or refund. This is a limited time, limited inventory offer. Marriott Rewards points will not be earned with the purchase of the GiftCards. Shipping and handling fees apply. $1 shipping option available to U.S. addresses only for orders less than $1,000 USD. See full Marriott Rewards Terms and Conditions. All Marriott Rewards rules and regulations apply. Rapid Rewards Terms and Conditions: Rapid Rewards Members will receive 1,200 points per $100 Marriott GiftCard purchase; 3,000 points per $250 Marriott GiftCard purchase; and 6,000 points per $500 Marriott GiftCard purchase. Only preset $100, $250, and $500 Marriott GiftCards are eligible for this promotion. Marriott GiftCards purchased in other denominations are not eligible for this promotion. Purchaser’s name must match Rapid Rewards account number to receive eligible points. Maximum amount of Rapid Rewards Points eligible to earn for this promotion is 12,000 points per Member during promotional period. Member must purchase Marriott GiftCards between August 1, 2012 and November 30, 2012. Valid on new purchases only. Shipping and handling fees apply. Please allow four to six weeks for points to post to your Rapid Rewards account. All Rapid Rewards rules and regulations apply. Priority Club has 16 Holiday Inn Resorts on flash sale using points at 50% off until noon today EDT. You can access this offer here. All these resorts are on sale from September 4th until October 2nd, 2012 for 12.500 Priority Club points per night from the usual 25000 points per night. This is a very good offer if you can take advantage of it. Priority Club has had few of these flash sales recently and you usually need to act fast. Club Carlson has launched a Club Carlson Global Giveaway for residents of United States and Canada. There are various prizes that you can win, but the icing on the cake is the 100 FREE Club Carlson points PER day that you can get by flipping through the Vacation Look Book. This offer is valid from August 14th to September 24th, 2012. You can get the 100 Club Carlson points for each day during this period. I just flipped through the first Vacation Look Book and will flip it through again tomorrow for another 100 points. This is very easy way to rack up few thousand extra Club Carlson points. You just have to remember to do it daily. Country Inn & Suites has turned 25 years. To celebrate this Club Carlson is offering 25000 bonus points per two nights stay at all Country Inn & Suites location between August 15th and October 14th, 2012. You must book using promotional code 25FOR25 to be eligible for the bonus points. This promotion is valid at all Country Inn & Suites locations worldwide. You need to register for this promotion before of your stay and be a Club Carlson member. Register for the 25 for 25 Event by clicking on the “Register Now” button below. You’ll need to be a Club CarlsonSM member to register. Not a member? No problem, just follow the “Join and Register” link below. Complete a two night stay booking the 25 for 25 Promotion Rate at any Country Inns & Suites By CarlsonSM hotel worldwide between August 15 and October 14, 2012. After you complete your stay, your 25,000 bonus Gold Points will be deposited in your Club Carlson account within 4-6 weeks. Then redeem your points for a variety of gift cards or other great redemption options. Just make sure that you include 25FOR25 in the promotional code field to pull up the rates for this promotion. 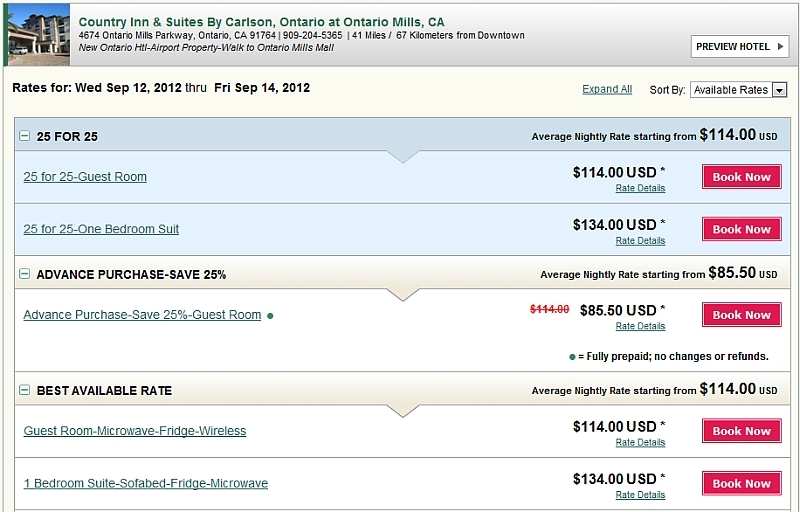 You need to choose a two night stay for the rates to be shown. Apparently the 25FOR25 is based on the Best Available Rate (BAR). The BAR is rarely the lowest rate, but is not a rack rate either. You need to choose if the 25K bonus points are worth more than the savings that you could get using advance purchase, AAA, and other discount rates that you are eligible for. Club Carlson has been very active in the promotional front for the past year. The various Ultimate Night Giveaway are now gone, although the Park Plaza version runs until the August 28th but the registration is closed. This Country Inn & Suites 25 year 2-night bonus of 25K Club Carlson bonus points is a good offer, if the best available rates for the dates are reasonable. The 25 for 25 Event (“Promotion”) is available only to Club CarlsonSM members for new reservations. To be eligible for the Promotion, members must register online for the Promotion atwww.countryinns25.com (“Promotion Registration”), provide their Club Carlson member number at the time of reservation or check-in of a Qualifying Stay, and then complete one Qualifying Stay at any Country Inns & Suites By Carlson hotel worldwide (“Participating Hotels”). A “Qualifying Stay” is defined as a stay of two or more consecutive nights in the same room at a Participating Hotel regardless of the number of check-ins or check-outs during the Promotion Period, for which the guest specifically booked the 25 for 25 Promotion rate The Qualifying Stay must begin on or after August 15, 2012 and check out must be completed no later than October 14, 2012 (“Promotion Period”). Guest must be present at the Participating Hotel at both the time of check-in and check-out, enrolled in Club Carlson at or before the time of check-in, and registered in the Promotion no later than the time of check-out (to enroll in Club Carlson, visitwww.clubcarlson.com). Members who complete the Promotion Registration will receive a 25,000 Bonus Gold Point award after the completion of their Qualifying Stay. This Bonus Gold Point award is in addition to the standard Gold Points awarded for a regular stay. An individual can earn a maximum of one Bonus Gold Point award for this promotion regardless of the number of Qualifying Stays completed during the Promotion Period. Only one Club Carlson account per Qualifying Stay will be credited with the Bonus Gold Point award. Allow 6-8 weeks for Gold Points to appear on account. The Promotion and Gold Points are subject to all Club Carlson program Terms and Conditions, including rules and restrictions regarding redemption for prepaid cards and retail gift cards which may not be available to all members and which vary based on member’s country of residence1. Only standard rooms are eligible for the Promotion and rates for each night of a Qualifying Stay may vary. Promotion is not valid on existing reservations and is subject to availability. Country Inns & Suites By Carlson is not responsible for: interrupted or unavailable network, server or other connections, miscommunications, computer hardware or software or technical failures, Internet Service Provider/network/website accessibility or availability, garbled or jumbled transmissions or other errors of any kind, whether human, mechanical or electronic; including without limitation the incomplete, incorrect or inaccurate capture of Promotion Registration information. Promotion void where prohibited by law. To the maximum extent permitted by law, Country Inns & Suites By Carlson reserves the right to add, modify or discontinue these terms and conditions or the Promotion at any time with or without notice. By participating in this Promotion, you agree and consent to these terms and conditions. Would You Stay at “Ikea” Budget Designer Hotel? Ikea has been hugely successful discount furniture chain. I go to Ikea few times a year to eat at their food court the Swedish meatballs and to visit the small Scandinavian food selection to pick up some knäckebröd or näkkileipä as we call this bread in Finland. 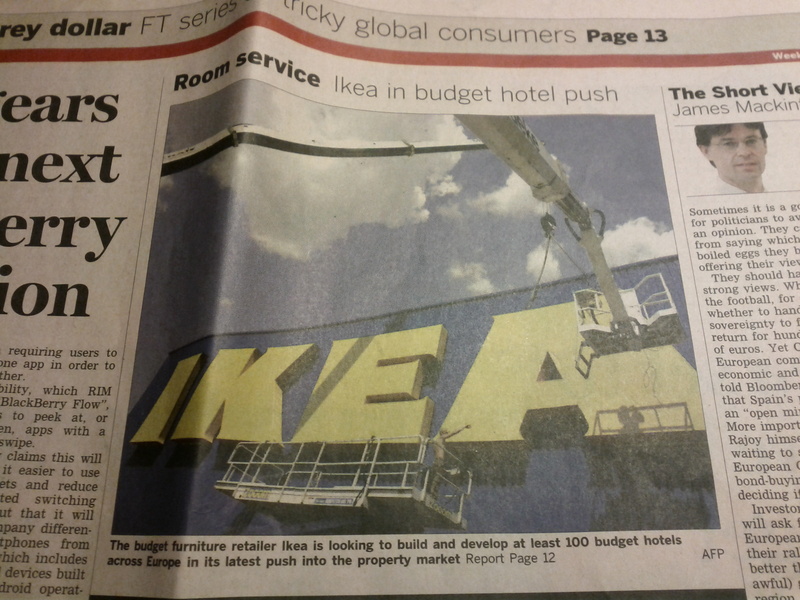 Now, Ikea is pushing into budget designer hotels and planning to open 100 locations in Europe in the next few years according to the Financial Times. They are looking for an established hotel operator to manage the chain for them. These hotels would neither carry the Ikea name nor furniture, but would rather be a financial real estate investment for them. It is interesting to see how this is going to develop. The only discount “designer” hotel chain that comes to my mind is the Starwood’s Aloft, which is the “vision of W hotels” according to their branding. Hyatt has now opened the registration for the fall 2012 “Imagine the Possibilities” promotion that I wrote about the other week. ELIGIBILITY/HOW TO REGISTER: To participate in this Promotion, you must be a Hyatt Gold Passport member and register for this Promotion. Current member online registration begins August 15, 2012 by visiting goldpassport.com/possibilities and ends October 31, 2012. New member enrollments from August 15, 2012 through October 31, 2012 will automatically be registered for the Promotion. Void where prohibited. PROMOTION PERIOD: Promotion begins September 1, 2012 and ends November 30, 2012 (“Promotion Period”). ELIGIBLE NIGHTS: For the purpose of this Offer, an “Eligible Night” shall be defined as one (1) night at any participating hotel or resort when choosing points or miles and paying an Eligible Rate (as defined below). Award nights shall not constitute an Eligible Night. Hyatt Gold Passport members will only receive eligible night credit for their room, regardless of the number of paid rooms. HOW TO PARTICIPATE: During the Promotion Period, complete five (5) Eligible Nights at any participating Park Hyatt®, Andaz®, Grand Hyatt®, Hyatt®, Hyatt Regency®, Hyatt Place®, Hyatt House™, or Hyatt Residence Club® hotel and resort worldwide. After your first five (5) Eligible Nights, earn 5,000 Hyatt Gold Passport bonus points. Earn 10,000 Hyatt Gold Passport bonus points for every five (5) subsequent Eligible Nights thereafter during the Promotion Period. A maximum of 65,000 bonus points may be earned during the Promotion Period. To receive bonus points, you must be a Hyatt Gold Passport member, register for the Promotion, provide your Hyatt Gold Passport membership number at reservation/check-in, be a registered guest physically occupying the room to which you are registered, and pay an Eligible Rate. For the purpose of this Promotion, an “Eligible Rate” shall be defined as any hotel published room rate, including, but not limited to, rates found on hyatt.com, the Hyatt Daily Rate, volume, AAA and senior citizen rates. 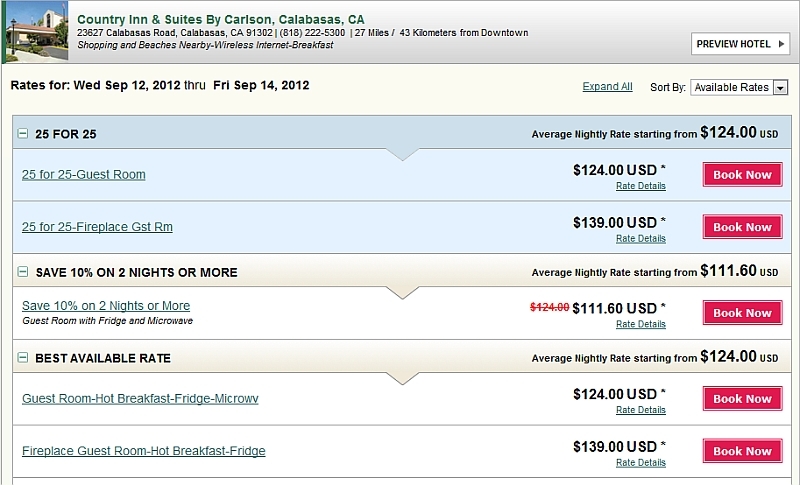 “Ineligible Rates” are discounted rates, including, but not limited to, any free night stays, Internet wholesale rates (such as priceline.com, hotels.com, etc. ), traditional wholesale rates (such as GOGO Worldwide Vacations, Pleasant Holidays, etc. ), airline crew rates, airline employee rates, travel agency employee rates, Club at the Hyatt discount certificate stays, Hyatt employee or employee family discount rates, airline interrupted-trip vouchers or contracted rooms (a contracted room is a room that has been reserved pursuant to a written and executed agreement between a hotel and a corporation, government agency or individual for a negotiated room rate in exchange for an agreed upon number of rooms to be rented for an extended period of time). BONUS POINT POSTING: Please allow two to three (2-3) weeks after your fifth Eligible Night (and every five Eligible Nights thereafter) for bonus points to be posted to your Hyatt Gold Passport account (allow 4-6 weeks for bonus points from nights outside the U.S.). Hyatt Hotels & Resorts® encompasses hotels managed, franchised or leased by subsidiaries and affiliates of Hyatt Hotels Corporation. The trademarks Hyatt Hotels & Resorts®, Park Hyatt®, Andaz®, Grand Hyatt®, Hyatt®, Hyatt Regency®, Hyatt Place®, Hyatt house™, Hyatt Residence Club® resort, Hyatt Gold Passport®, and related marks are trademarks of Hyatt Corporation and its affiliates. ©2012 Hyatt Corporation. All rights reserved. You can now write a short review of the InterContinental hotel where you have stayed at on their website. Starwood launched a similar initiative late last year. 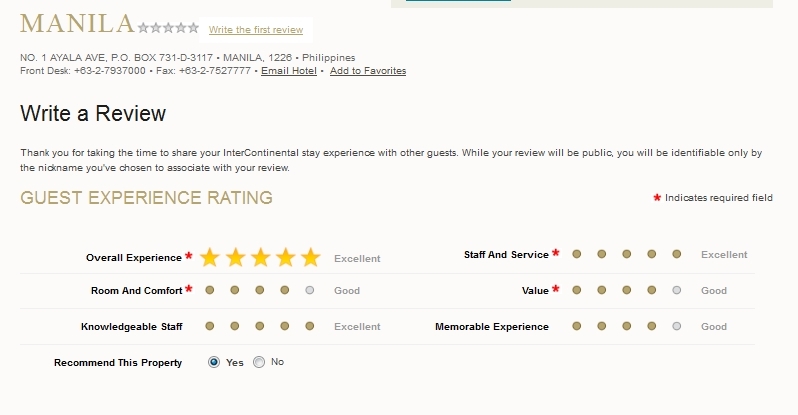 As always, I wanted to test this review process and decided to write a short review of InterContinental Manila where I stayed at this past May. 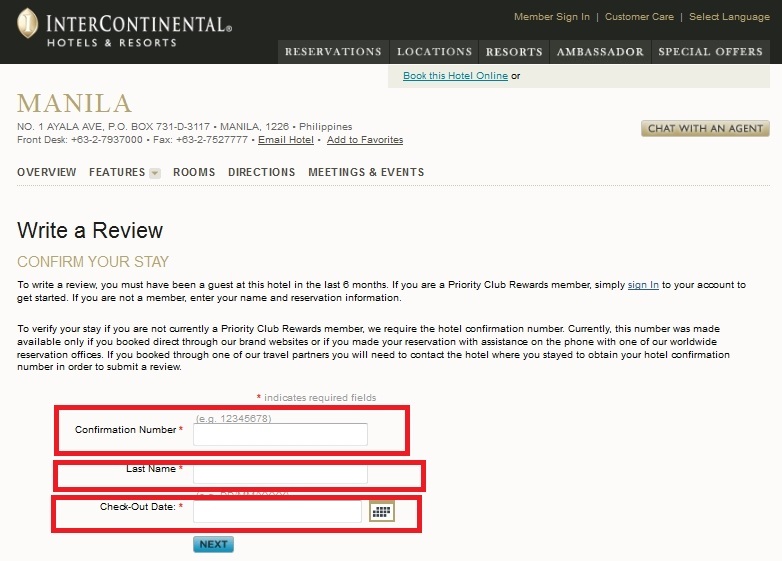 You can access the review submission interface by going to http://www.ichotelsgroup.com/intercontinental/en/gb/locations/reviews/write-a-review/manila and switching the city at the end. You need to have your reservation number, last name, and the date of check out available. 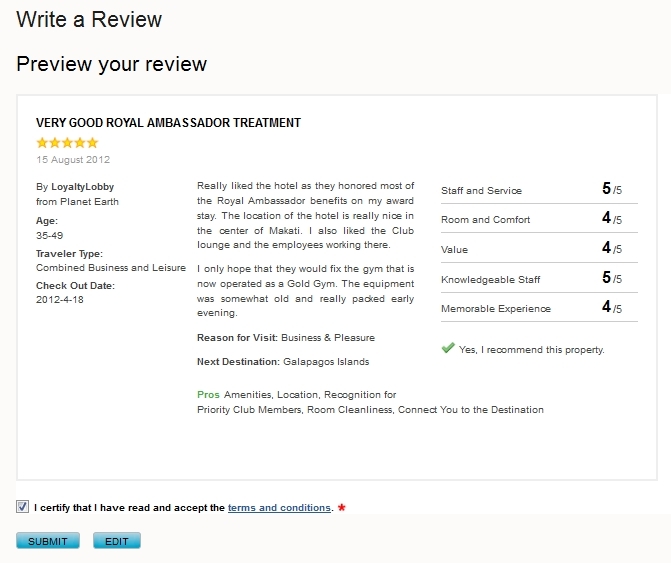 It seems that they want to validate that these reviews are done by actual hotel guests. Then you will give hotel the overall guest experience rating. As you can see, my stay at this property was very good. You need to do a write up of between 75 to 500 words. I decided to point out that they honored most of the Royal Ambassador benefits even on an award stay. Then you can check some pros and cons about the hotel. I do have quite a few photos of this hotel but decided not to upload any of them. They want some basic information about me. You can then have a look at the preview. Just submit and you are done. 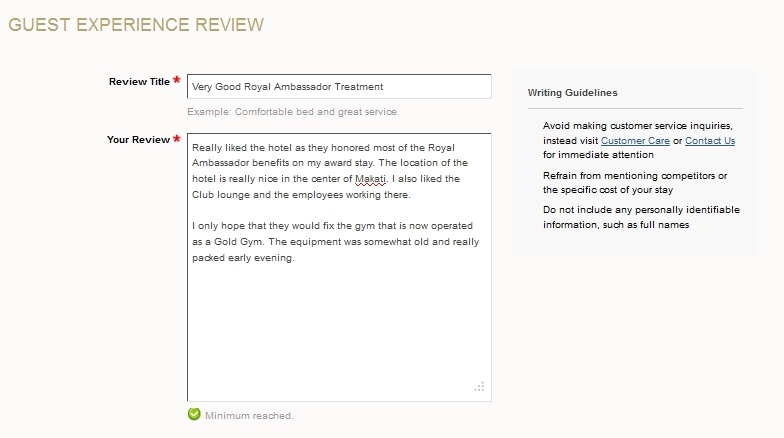 It seems that leaving review of properties is slowly coming to all hotel websites. Personally, I prefer reading on an independent website like TripAdvisor or FlyerTalk than the branded site. I just always have a feeling that they really don’t want to publish reviews that are critical of the property in question. There are also lots of rules regarding what you can write if you want your InterContinental review published. The terms are whopping 1139 words. The submission guidelines are somewhat reasonable few hundred words. Let’s see if my favorable review of the InterContinental Manila will get published on one day. What’s Happening with United Airlines? The U.S. Department of Transportation just released their August Air Travel Consumer Report for the month of June, 2012. I have been following these reports to see if United has had any improvement when it comes to delays & complaints. The United’s numbers on the latest report are downright ugly compared to other legacies in the United States. You can access the August Air Travel Consumer Report here. Compared to the first quarter of 2012 when United’s flights arrived on time 80.9% the June figure of 70.1% is bad. It is also the dead last compared to major legacies and regional carriers. United was third as of percentage of operations cancelled at 1.6%. In June United canceled total number of 727 flights. This number doesn’t include cancellations by United Express carriers. 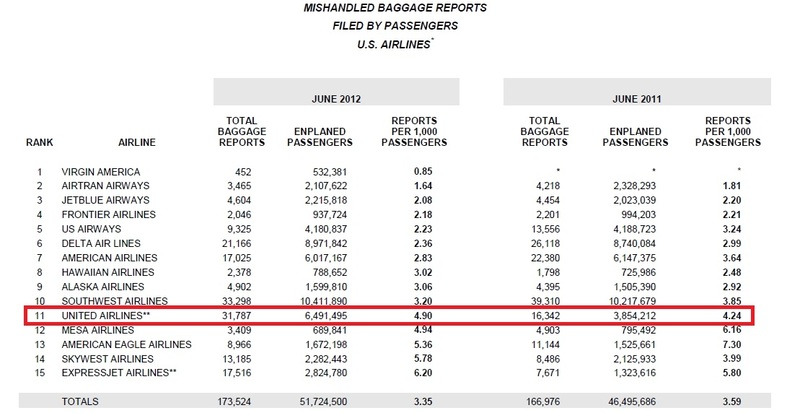 United has, again, the highest number of mishandled bags at 4.9 per 1000 enplanements. Compared to June 2011 the number is 15.6% higher. Airlines maximize their revenue by overbooking their flights. There is no incentive neither for full fare/flexible ticket holders nor restricted ones to actually cancel their travel arrangements even if they are not making their flight(s). In a case of overbooking, airlines tend to try finding volunteers first by offering them future travel credits and confirmed space on later flights. If there are no volunteers, the airlines then start involuntarily deny passengers. Compared to April to June 2011 to 2012 period United’s number of involuntarily denied boarding compared to number of passengers enplaned, has more than doubled from 0.93 to 2.11 per 10000 passengers. United is dead last on legacy carriers on this measurement as well. Your likelihood of getting involuntarily bumped on Delta is about one sixth compared to United. Filing a complaint with the DOT’s Aviation Consumer Protection Division is normally the last resort if the carrier has not resolved the issue using other communication channels. The number of complaints that United has received is more than double per 100000 enplanements to compared to second last which is US Airways. For comparison, Southwest had more enplanements than United but only received 19 complaints compared to United’s 585. 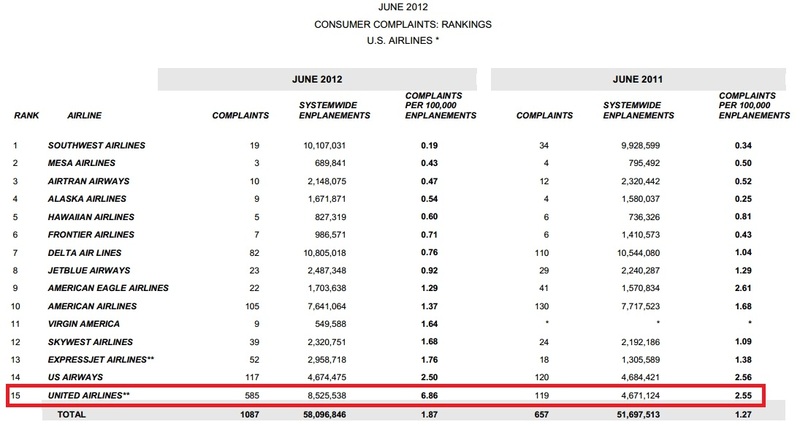 Compared to June 2011 the number of consumer complaints that DOT received in June 2012 is 169% higher when adjusted for number of enplanements. Of all the 1353 complaints that the DOT received against the airlines operating in the United States (excluding foreign) ones, United’s share of 585 complaints represents 43%. Obviously the operational merger with United Airlines and Continental Airlines has not gone as expected. The DOT operational and complaint figures doesn’t paint a very rosy picture of the current state of the airline. I have flown more than a million mile with United and Continental combined and went through the difficult bankruptcy time as a United frequent flier member in the early 2000’s. It is sad to see that merger hasn’t worked anywhere near as expected from the consumer’s point of view. These DOT statistics are just horrific. Why I Prefer Booking Airline Tickets Using Online Travel Agencies Like Expedia? There seems to be two schools when it comes to buying airlines tickets; one group prefer always booking using the airline’s own websites and the other uses travel agents like Expedia. 1. Easier to compare prices among several airlines. 2. Agents are often able to offer more combinations than airlines. 3. You can easily ticket from different country than where your credit card is issued. 4. No need to present a credit card at check in. 5. I can get some cash back for my purchase. 6. I can choose the country where the ticket is issued. 7. I don’t have to go through the process of declining all the “extras” that the airlines are trying to sell in addition to the air transport. 8. The agent, the ticketing carrier or the operating carrier can fix and help in case that there are problems along the way. 9. Automated ticketing. Some carriers still queue some reservations for manual review before the electronic ticket is issued. 1. The agent should do all the changes before the travel begins. 2. There could be a charge for using the agent’s services. 3. Sometimes it is difficult to pull up the exact fare rules. Even if you have a Priority Club account and Gold or Platinum status, it might make sense to sign up a family member as well for all the bonuses you can get. This works especially well at the properties where there are not any benefits for being a Gold or Platinum member. I just had a stay with a family member at a Holiday Inn Express location. I signed up for all the one time bonuses that you can find here and for other ongoing bonuses that you can find here. Also, the property in question was offering an opening bonus of 2K Priority Club points per stay. 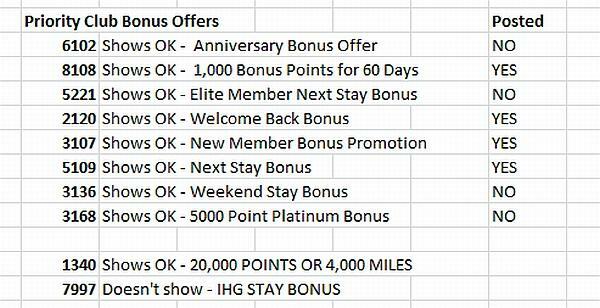 All the bonuses except the Anniversary Bonus Offer & Elite Member Next Stay Bonus-posted. The 2K opening bonus from the property should post separately in couple of weeks. It can make sense to open a Priority Club account for a family member as well to take advantage of the available bonus offers. By taking advantage of the survey offers and downloading a toolbar, the account should have more than 10K Priority Club points that is enough for two free nights using Point Breaks. Last week, I wrote about the ability to transfer miles from BMI Diamond Club to British Airways Avios. The tool was introduced back in July but, at the time, it had some functionality issues that I also reported. I thought that everything going ok with my transfer. How wrong I was! Apparently the miles that I transferred from BMI to BA expired the very same day that the transfer was completed. I have not had any activity on my Executive Club account for years as I have credited all my onewold alliance flights to American Airlines AAdvantage program. The BA’s system incorrectly just expires them. I thought that this would be a perfect occasion to test how good BA’s Twitter team is at resolving issues. Sent the above tweet yesterday and should hopefully hear something from BA later today. BA’s system incorrectly expires miles that are transferred from BMI if you haven’t had any account activity for some time. Not sure why BA has not corrected this issue. If you have the same issue as I, you need to contact British Airways Executive Club to correct the issue. Wyndham is having an opening special at 20 properties around the United States that are either new build or reflags from other chains. You will get 16000 bonus points per stay for up to 3 says for total maximum of 48000 bonus points. Your stays need be between August 6th and October 6th, 2012. Note that you can combine this with other active Wyndham promotions like the current Summer 2012 promotion of quadruple miles or points. We’ve just opened 20 new hotels and want to invite you to celebrate with us. Simply complete one stay through October 6, 2012 and you’ll earn 16,000 Wyndham Rewards points. That’s enough for a free night! Plus, as an added incentive, rates are starting at $59.99 at the new Hawthorn Suites by Wyndham hotels and $79.00 at the new Wyndham Hotels and Resorts hotels. There are many locations to choose from across the United States so book now and take advantage of this limited-time offer. This is a very nice bonus offer for the 20 properties in question. Even if you are not planning to redeem for Wyndham stays, you can always convert the points to airline miles. One stay at these properties should earn you enough Wyndham Rewards points for 7000 airline miles transfer. To qualify for the “16,000 bonus Points” promotion (the “Promotion”) and earn 16,000 Wyndham Rewards® points, the member must (i) be an active member (ii) click through the email and book a stay at any of the 20 participating properties at a qualifying rate between August 6, 2012 and October 6, 2012 and complete their hotel stays by October 9, 2012. (the “Promotion Period”). Members will receive 16,000 Wyndham Rewards points for up to 3 stays within the Promotion Period at any of the 20 properties regardless of the number of rooms booked. 16,000 bonus points is redeemable for one free night stay at a Tier 4 hotel. Member stays with check-out dates after October 9, 2012 will not be counted towards the Promotion. One stay includes all consecutive nights at the same hotel regardless of check-ins or check-outs. For a full list of the 20 participating properties click here. Members should allow six to eight weeks after completion of stay for the bonus points to be credited to their account. 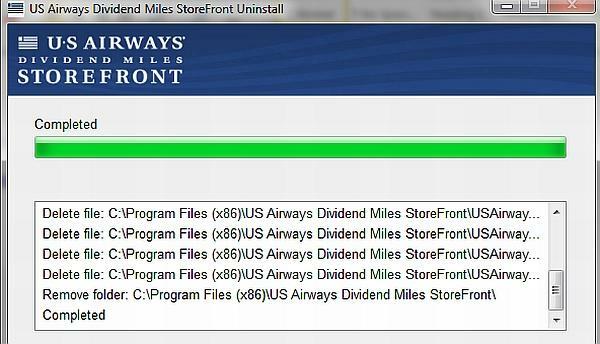 When I was poking around my US Airways Dividend Miles account yesterday, I came across this offer of 500 miles for downloading their “StoreFront Shopping Assistant”. I have more than 179K miles sitting on my account, but would need to get the account to 180K for an award redemption. I could always buy the required points or transfer them in from a hotel program like SPG. But, hey, if you are giving me free miles, I am happy to take them off your hands (Cartera’s in this case). Word of warning; this requires downloading software to your computer, installing it, and doing at least a search before uninstalling it. This should be enough for the free miles to post per the terms and conditions. *To qualify for the initial download 500 bonus miles offer, make at least one search or purchase using the Dividend Miles StoreFront Assistant. Bonus offer is valid only for the initial download and install of the Dividend Miles StoreFront Assistant. Not valid on subsequent downloads or installs. For a list of complete terms and conditions please click here. Here’s direct link for the offer, but you should find a banner on your Dividend Miles account advertising this offer. There were few steps in between including your Dividend Miles account number and last name. They didn’t ask for the account password, however. Then there was an offer to register credit cards for some in store offers as well. I did bypass this as I was only interested in getting the free miles. The download is rather hefty at 12.3MB. It doesn’t take too long on a good internet connection. You have to agree the installation thing before it is up and running. It then requires you to close all your browsers. After installation you will see additional bar on your browser. I did couple of searches that should be enough for the miles to post per the terms and conditions. I didn’t want to leave this “spyware” on my computer. So, I decided to uninstall it. Some work for the 500 miles, but I needed them to hit the 180K RDM mark. Just make sure that you follow the terms and conditions of this offer closely and take couple of screen shots along the way.